So you want your bike tuned? It should be easy, shouldn’t it? You nick over to your favourite dyno equipped mechanic, watch them strap down your precious then wring the living daylights out of her. There’s no sound quite like a litre bike being dyno tuned with a “race” pipe fitted. Forget ear splitting, this is several levels past that, try mind cleavingly loud, even that doesn’t do it justice. It’s off the loud scale. Ferocious. Indeed. Several runs later and voila, they’ve built you a custom map which gets loaded to your (or their) favourite inline piggy back module. Piggyback? Yep, these modules by the likes of Dynojet or Bazzaz sit inline with your bike’s fuel injector electronics and allow more or less fuel to be squirted into the cylinders based on the maps they’ve made for you. Neat huh? Yes, and no. I’ve used them previously but I now call them dinosaur mods because their approach is so antiquated that soon they’ll go the same way: extinction. OMG, why’s that you ask? There’s a better way. A much better way and until recently only the recourse of those die hard individuals who think nothing of ripping out the electronic brains from their bike, stuffing it in airmail bag and hoping that it gets returned unharmed some weeks later. And when it does come back hoping that it’s also been toasted properly. All jokes aside, a custom ECU “flash” has to be best way to get the electronic brain of your bike set up to ensure that modifications like that carbon fibre work of art exhaust, which saves precious kilograms of weight, doesn’t kill your engine. Why? Any time you change the flow of gasses coming into or out of your bike you should retune her. Hang on, I still didn’t get that. OK, it’s easy. If you say stick in one of those “race” air filters which provide higher flow rates than stock (and just need to be cleaned and not replaced at the service intervals), then your bike will be getting more oxygen than before. 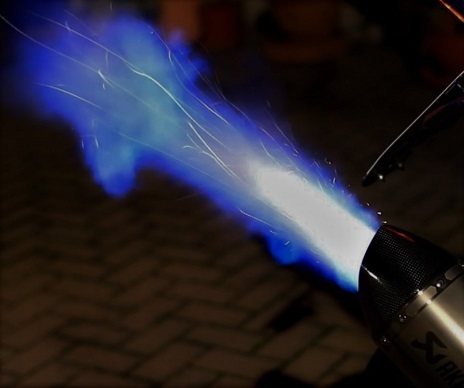 If you stick that carbon fibre work of art can on, which shoots lovely blue flames out the back at night, then you’ve changed the “back pressure” from your engine. How about different fuels? If you’ve read this far you probably religiously use 98 octane and avoid “sugar” (ethanol) fuel like the plague that it is. Don’t get me started on that. It’s another whole article. So with your 98 octane fuel, high flow air filter and flame throwing pipe she probably runs a bit odd. Odd is probably an understatement, surging at idle and a not so faint petrol smell will likely be evident. Keep her like that for any length of time and your mechanic will likely be doing an engine rebuild for you in the near future. So, back to the dyno. Great huh? No, not really. Sure they’re great for bragging rights about whose bike puts out the most Newton metres of torque, whose struts the most ponies etc. but they’re not real world tests. Sure they have their place, doing $2.80 on public roads can be tricky: tricky to find the roads; tricky to ensure they’re flat, gravel free, smooth, long enough, native wildlife free and devoid of other traffic. Tricky. Race tracks? Absolutely. Great place to be. And far safer for you, your driving license and the general public. But, it’s not always practical to pop down to Philip Island for a tuning day. Hang on, if you did do that you’d need data logging gear, specialised sniffers and telemetry to log what your precious was doing, then all the software and hardware to make sense of that all, then a way to store that map. So, what’s with this ECU flashing? Do you need a rain coat and a fast getaway for this? In simple terms your bike has a brain, it’s known as an engine control unit. The ECU stores all the details about your bike that it needs to run. Things like the amount of fuel that gets squirted into the cylinders in different gears and at different throttle openings. Your ECU holds lots of tables with this information and uses it while you’re riding. Flashing an ECU is the act of changing the information inside your ECU. Information, or data, like the maps that your mechanic made for you on their dyno. How much better would it be to simply write these maps directly into your ECU instead of having to acquire another mini brain bypassing your main brain and load the information into that? Exactly. Much better. Talk to the brain, the one brain, not some intermediary. Until very recently the only way to reflash your ECU was by mailing it, generally overseas for us Australians, to an expert service with people who’ve spent the not inconsiderable time needed to decode your particular brand of bike brain and have built up the expertise to speak its language. You tell them what mods you’ve installed and they burn these fuelling changes into your ECU’s electronics. Imprecise. For sure. Every engine leaves the factory ever so slightly different to its siblings. No two bikes are exactly alike and therefore no two bikes require exactly the same fuelling changes. How about if you change pipes, filters etc. then you’ll need another reflash. So we’re back to the dyno and the piggy back modules? Not anymore. Enter stage left Justin Woolich from WoolichRacing.com, Justin has worked to develop affordable ECU flashing kits that allow everyone from the average rider to top level superbike teams to tune the stock ECU on their motorcycle. 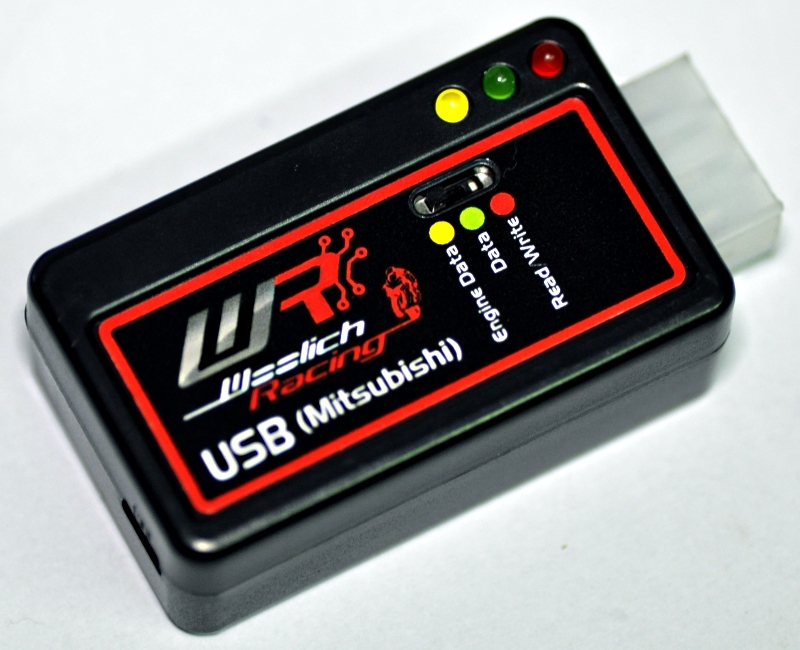 The development began with the ecueditor.com software and was continued and expanded with the Woolich Racing line of ECU Flashing hardware and software. Interestingly you can change many of these settings on a per gear and per cylinder basis for the ultimate tune. You can also change individual modes, such as the Low, Medium and Full Power mode independently. Awesome. I want one. But hang on a sec. What about getting the tuning data in the first place? Don’t I still have to get my precious to have her neck wrung? No. Not anymore either. 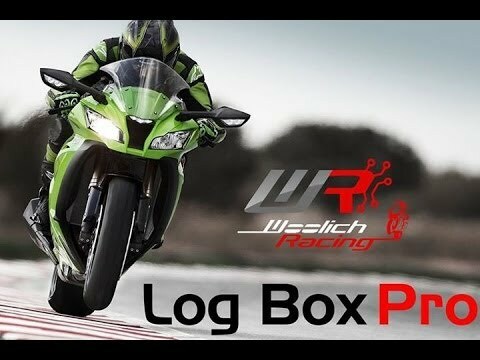 Woolich Racing recently released what’s called a “Log Box Pro” (LBP) for the Mitsubishi ECU which acts as the brain behind the ZX-10R and many other Kawasaki bikes. This kit comes optionally with what’s known as a wide band O2 sniffer. Essentially it’s an electronic plug that screws into your exhaust pipe. This then “sees” the flow of oxygen going past it when you’re using your bike. That data is then recorded to the LBP together with the relevant engine data at the time, including the RPM, throttle position or IAP (inlet manifold pressure differential, used at low throttle settings); the actual air to fuel ratio (AFR) seen by the O2 sniffer and your coolant temperature amongst others. Armed with these log files you tell Justin’s software what AFR you’d like and apply “trims” to your fuel maps, you can then burn these changes directly back to your ECU. Wonderful. But why would I want to do all of this? Let’s get back to the very beginning. Remember how you need to generate some data, typically via a dyno. What’s wrong with that? It’s not real world riding. What? Well, think about it this way. A bike strapped down to a dyno will generally have air being blown over it but not even close to the amount of air you’d get when riding on the open road. But that’s a tiny difference? No, not really. A number of bikes today have what’s known as a RAM air intake. This forces high pressure air straight down the throat of your bike and straight into the airbox and down into the combustion chambers. Mimicking $1.00’s worth of air pressure isn’t easy. That’s 100 km/h of wind. Not just into the RAM air intake, but also to cool your bike. They get hot, very hot when being dyno tuned. Temperature differences make a difference when tuning too. So the ideal situation would be to acquire data about what your bike is doing while it’s doing what it usually does on the road or track. Sure dynos still have a place, especially for printout bragging rights but for capturing real world data there has to be a better alternative. And now you can do this as much as you see fit. Scary huh? No, not really. It’s actually simple to tune your own bike yourself. Here’s how it’s done. You acquire the LBP and O2 combo plus the “bin” file for your specific model of bike from Woolich Racing, splice the kit into your bike and enable data logging then start riding. After you’ve ridden for a while, you load the captured data into the Woolich Racing Tuned software, let it analyse the AFRs from the data and it then offers you a map which you can write straight into your ECU. Rinse and repeat, fine tuning as necessary. Typically you’ll need to do this a few times to get as close to a perfect tune as you want. And it’s got to be better than a dinosaur piggyback module or a workshop dyno. Oh, and if you change anything like your pipe or air filter or simply if you want to wring that very last pony out of your precious, you can reflash as often and as many times as you want. All without additional visits to your dyno equipped mechanic with incremental time and expense. Justin has a catch phrase on his website: Tune your bike to the limit. With the Woolich Racing kit you get to decide what that limit is. This article was first published in March 2014 on www.woolichracing.com and subsequently in June 2014 in Good Vibrations the club magazine for Melbourne Sportsbike Riders. The author is not affiliated with Melbourne Sportsbike Riders. All product names, logos, brands, trademarks and registered trademarks are the property of their respective owners.